Chocolate Tahini Coffee Cake for sale. Buy online at Zingerman's Mail Order. Gourmet Gifts. Food Gifts. Peanut butter cup, in cake form. Nutty, tahini (sesame seed paste) based coffee cake, swirled with a ribbon of chocolate. 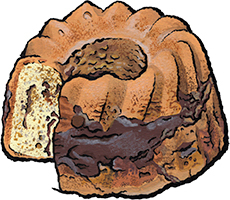 Think of it as a slightly exotic version of a peanut butter cup in coffee cake form, with all the flavor but none of the peanuts. Kids love it 'cause it’s got chocolate inside. Adults love it ‘cause it’s straight up delicious. Gift givers love it ‘cause there’s nothing like it anywhere. Gift boxed in our wooden cheese crate or our fun, cartoon cardboard gift box.